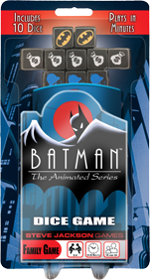 Daily Illuminator: Preorder Batman: The Animated Series Dice Game Today! November 11, 2016: Preorder Batman: The Animated Series Dice Game Today! 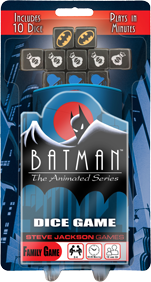 Batman: The Animated Series Dice Game is shipping as we speak, and available for preorder now at your friendly local game store and Warehouse 23! I bet you didn't see that coming. Because Batman is sneaky like that, a stealthy do-gooder, always foiling the plans of honest, hard-working criminals. You play one of those Super-Villains, The Joker, Poison Ivy, The Riddler, or Catwoman, and try to get the most money out of the bank before the Bat catches up! Banks have so much money, they surely won't miss a few extra bags, right? 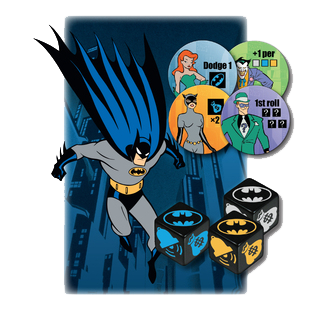 In addition to a wide retail release, we have a fun surprise – Batman: The Animated Series Dice Game will be available in very limited quantities for early purchase at BGG.Con! We'll also have a chilling promo card for the ice-cold villain Mr. Freeze. So if you're at the convention, make sure you swing by our booth, demo the game, and grab a copy before they're gone. If you aren't lucky enough to be at BGG.Con, though, swing into your local game store and place a preorder! Just don't let Batman catch you first.